This tutorial explains the basics. You can check the in-game help for more advanced directions. 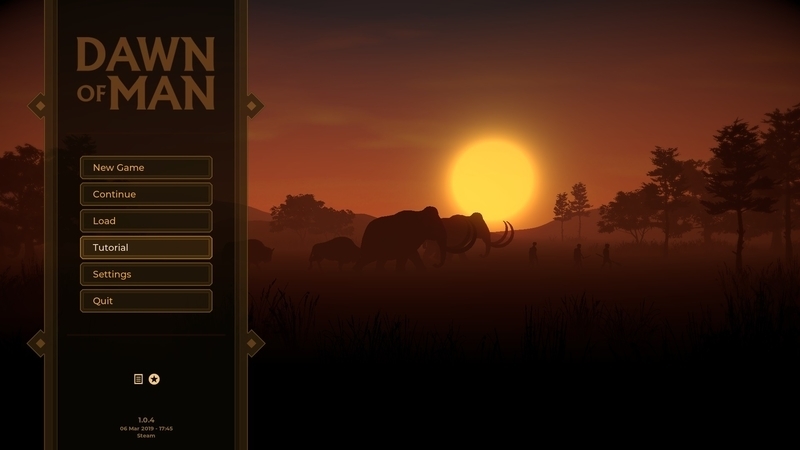 Dawn of Man uses FPS style camera controls. Move the camera using the WASD keys. Rotate the camera using the QE keys. Zoom the camera using the mouse wheel. Note you can pivot the camera around a point by rotating and panning at the same time. You can check out the more advanced controls in the help section, and customize the keys in the settings menu. Your people will need a constant supply of food to stay alive. One of the more predictable sources of food is fish from rivers and lakes. To send people to fish, select a river, then click on the fish button. rivers, animals, structures..., then choosing one of the options in the selection panel. Use button or press 4 to set game speed to 8x. You now know how to assign tasks to your people. This is a good way of micromanaging them. Too much micromanagement is tedious and inefficient. that people will perform continuously. the max number of people performing the action at one given time. By default only one person at a time will go to any given work area, but you can increase this if required. Well done, your people will now continuously gather resources until the limit is reached. Now that you have some raw resources, let's craft some hunting tools with them. 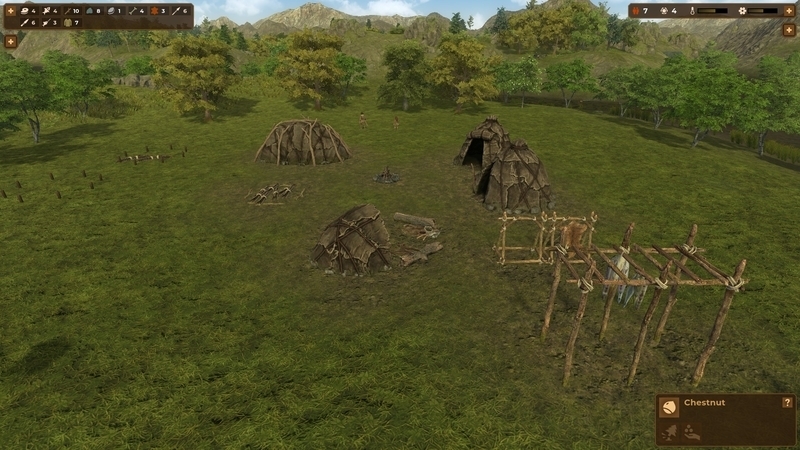 The main crafting structure in the Stone Age is the Crafter, to build one, select the build option in the main menu, then the production button, then the crafter structure. To craft tools, select the Crafter then click on a tool recipe. will perform it as soon as they can. Let's craft some Wooden Spears to hunt animals and some Bifaces to butcher them. We now have all the tools we need to go hunting. Hunting was a tricky business in the Stone Age. Killing a large animal with sticks and stones was no easy feat. avoid large animals and carnivores until you have the right tools and manpower. To hunt an animal, select it, then click on the hunting button. and bring the resources to camp. how many of them to send, based on the difficulty of the prey. Sometimes, you might want more control over your people's actions. You can do this by selecting a few people, then right clicking on the terrain or target. This way you can move people around, or assign one or more individuals to a particular task. This is especially useful for hunting at the beginning of the game, when resources and manpower are limited. on all the possible ways of controlling your people. they are used to craft clothing and build structures among other things. in order to do this you need to build Skins Dryers. crafting material in the early eras. Hunting new animals, gathering new resources, reaching certain population levels, etc. which unlock new structures, plants or mechanics. which allows you to process Raw Meat and Raw Fish into Cured Meat and Dry Fish. These last for a lot longer and can be stored for the winter in a safe place. in a storage structure to preserve it for as long as possible. Manually producing every item is tedious and inefficient. You can right click on a recipe to toggle continuous production. Your people will then keep on producing the item until the resource limit is reached. Your people will now continuously produce the tools until the resource limit is reached. Note that some recipes are set to continuous production by default. If everyone is well fed and taken care of your settlement will reach a high level of welfare and prestige and more people will want to join it. For new people to join the village you have to build enough residence buildings to accommodate the new population, otherwise they will not come. New humans will now join your settlement. Note that your settlement can also grow when your people reproduce, this plays a more important role when you reach larger populations, as you can have a larger number of births. You now know the basics on how to run aj settlement. Note that there are quite a few other mechanics in the game that are not explained here. You can get more info from the loading screen hints, Ul tooltips, or the in-game help menu, that explains all the concepts in the game with a lot more detail.